The Eskadron Control headcollar. Leading young or disobedient horses can have dangerous consequences for the human as well as the horse. Most horse owners use a lead chain to deal with this problem. In the case of the Headcollar Control with integrated lead chain it is possible to make use of this function in three different stages. Normal use: The rope is attached to the ring on the headcollar. Use with influence: The rope is attached to the chain ring in such a way that no pulling force is exerted on the chain. Use with strong influence: The lead rope is attached to the chain ring in such a way that pulling force is exerted on the chain. 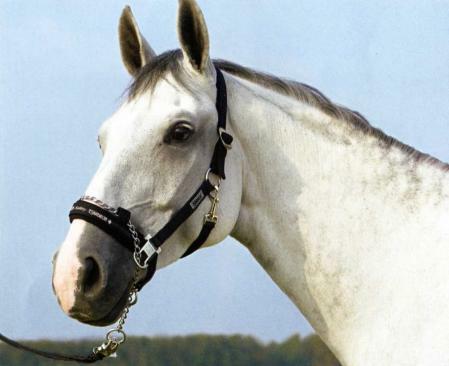 With the Headcollar Control you improve influence on your horse and increase your own safety. This avoids any necessity for the tricky attaching and removing of the lead chain. It is essential for it to be fitted correctly to your horse's head. In the animal's interest the user must ensure that he/she observes reasonable bounds in the applications. The rope is attached to the ring on the headcollar. The rope is attached to both chain rings, no pulling force is exerted on the chain. The lead rope is attached to one chain ring, pulling force is exerted on the chain. For three decades ESKADRON have stood for qualities which are highly esteemed by all horsey people: reliability, professionalism and durability in an attractive design. Horse riding tack like no other. 5 stars Brilliant piece of kit to have when my 17.3hh gets a bit sharp! 5 stars A very efficient way of managing a 'strong' pony enabling my daughter to cope with him when he was feeling determined. Would have preferred a normal buckle than the thread through kind. But overall�excellent! 5 stars Product exactly as described - very good quality and delivery service excellent. 5 stars I have found this product to be very good. Feel like I have more control as I am doing some road work with my yearling. It was her first time out on the road using this product. Great purchase. Very good service too. Material: (87) Double processed 25mm, tear proof webbing.